Registrations for the 2019 edition of Summit Racing Equipment Motorama at Atlanta Motor Speedway are now open to all enthusiasts who want to be part of the annual celebration of anything with a motor. Atlanta Motorama returns for its sixth year on April 27-28, 2019. Since it first began in 2014, Summit Racing Equipment Atlanta Motorama has featured cool cars, tricked-out trucks, sensational shows, and a myriad of motoring merchants. Chuck Weber, of Peachtree City, has always been there, too. In fact, Chuck was the first person to register to participate in the inaugural event in 2014. "It was just sheer luck," Weber said. "I just wrote out a check and said, 'Here, sign me up!' And I ended up being number one!" What started as luck has turned into a pattern; in each of Atlanta Motorama's five years so far, nobody has signed up to be there before Weber. So it should come as no surprise that Weber recently extended that streak to six years by being the first person to sign up for the 2019 edition. Weber has several cars, but he always brings one ride he takes particular pride in sharing with fellow car enthusiasts. "It's a 1932 Ford, what they call a five-window coupe which means if you count the windows that's how many windows are in it," Weber explained. He's made a lot of changes to the car in the 17 years he's owned it; the car sports a Chevrolet motor kicking out about 300 horsepower, a paintjob with flames sprawling along the sides of the coupe, and an instrument cluster along the dashboard that Weber designed himself, just to name a few. "I've changed about 98 different things," Weber said. "Every year I tear it down and do something to it." Weber's passion for motorized vehicles started when he was just a boy. "I started out as a kid with model airplanes and I transferred from there to motorcycles, motor scooters, airplanes, and then cars," Weber recalled. "(It was a) natural progression for me. All the kids were doing it when I was growing up." Today his enthusiasm for cars is as strong as ever, and each year when Motorama rolls around the motorhead in Weber can't get enough. "I hardly ever stay around [my] car," Weber said. "I'm busy looking at everybody else's rides. I get ideas from everybody else's ideas. I like 'em all." "If you walk fast," he said with a chuckle. "Of course you stop and look at the ones that you're really interested and just give a glance at the others, but there's enough to keep everybody's interest." 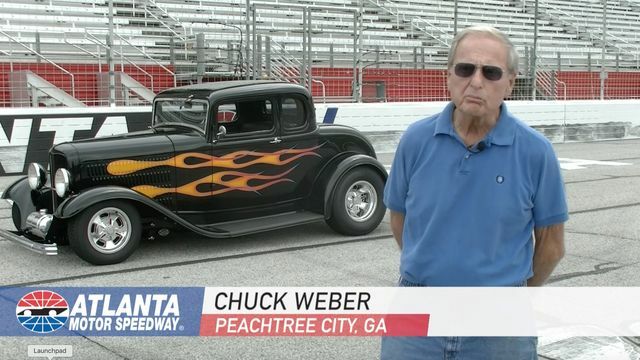 Weber, his prized vehicle, and a whole lot more will be on display at the Atlanta Motor Speedway when Motorama returns on April 27 and 28, 2019. You can be too, whether you want to show off your own ride, sign up as a vendor or just take it all in as a spectator. Spectator tickets are priced at $15 per day or $20 for a two-day weekend pass; kids ages 12 and under get in free! Admission includes access to all areas of the show including the vendor midway, show car garage, extreme motorsports and much more. All participant registrations include infield vehicle admission to park in the show area, a pair of two-day tickets, FREE autocross entry, a goody bag stuffed with great gifts and offers from sponsoring partners, and an entry to win from more than $20,000 in cash and prizes as part of the Super Prize Giveaway!